The Moon Under Water Pub & Brewery out of Victoria have 4 standard beer in their lineup. One of the 4 beer is the “Creepy Uncle Dunkel” a type of dark lager. The beer pours a deep ruby with a tan head. The aroma consists of fruits, caramel, chocolate and malts. The flavour is of roasted malts, coffee, dark fruits, chocolate, caramel with a mild bitterness at the finish. Like most Lagers this beer is fairly thin but very tasty! The alcohol content comes in at 5.4%. Moon Under Water Pub & Brewery is looking to step up their presence on the Mainland and I am all for that! If you haven’t tried their beer yet or if its been a while take a chance on a bomber or 4 of their beer! Commercial Description: Pilsner’s creepy Uncle. Dark and complex, the most misunderstood of all Lagers. Dark Munich malts, and a little roasted wheat give this brew a rich, vanilla and nutty-sweet palate with a dry, rounded finish. Unfiltered as always. Maybe it’s the long decoction mashes or the 5 week lagering time he spent alone in the cold… or perhaps he’s just a complicated dude? 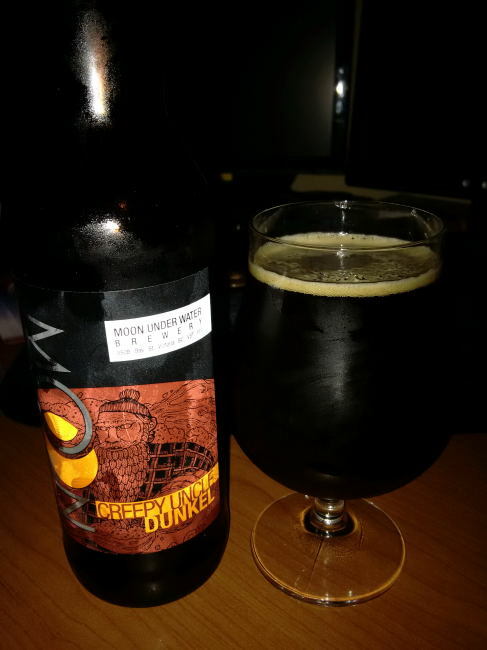 This entry was posted in dunkel and tagged bc, beer, bitterness, canada, caramel, chocolate, coffee, creepy uncle dunkel, dark fruit, dark fruits, dunkel, hops, hopy, mild bitter, mild bitterness, mild hops, Moon Under Water Pub & Brewery, moon under water pub and brewery, roasted malt, roasted malts, vancouver island, victoria. I thought this was a good and tasty Dunkel, voters on beermebc.com seemed to think it was a tad better though with an 8.6/10 rating. It has been 6 months or so since trying this, perhaps it is time for another go? Might just be a good idea. Or at least next time you have a craving for a lager just skip the yellow fizzy stuff and go for a bottle of this. My rating would probably fit in between 7 and 8 of your rating system.